A holiday cookie inspired by two of my favorite treats: chocolate chip cookies and caramel lattes. 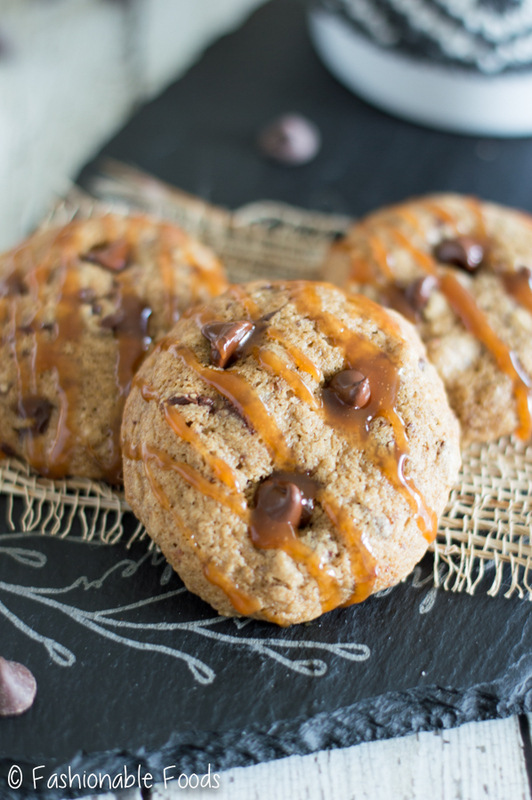 These caramel mocha cookies allow you to have your coffee in cookie form! Happy Monday! Did you have a nice weekend? I’m certainly feeling the holiday spirit with loads of Christmas movies, wrapping presents, and of course, cookies! I’m super excited about today’s recipe… and even a little nervous! Not only are these caramel mocha cookies amazing, but they are representing Delaware in Bob’s Red Mill’s United States of Cookies! Just because Delaware is a small state doesn’t mean we aren’t full of great ingredients! Not only can you find an abundance of locally grown produce (like amazing peaches), but you can also get your dairy products, poultry, and even fresh roasted coffee beans! These caramel mocha cookies are inspired by my love of coffee and all of the amazing coffee shops that Delaware has to offer! Although I’ve only lived in Delaware for a few years, I’ve fully embraced this beautiful state and am very proud to be representing my new home in cookie form! When coming up with an idea to represent Delaware, I knew I wanted to think outside of the box. 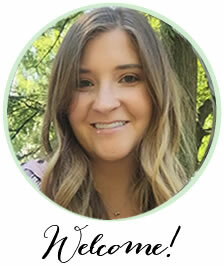 There are so many great ingredients available throughout the state, but I really wanted to create a unique recipe and showcase one of Delaware’s hidden gems. Peaches would have been an obvious choice, but since they aren’t in season anymore, I decided to go with something that’s always in season: coffee! Obviously Delaware isn’t a producer of coffee, but who knew fresh roasted beans were so readily available here? I sure didn’t. I began noticing different local coffees during my visits to various farm stores. Of course I had to find out what this was all about! It only took a quick Google search to find that there are a lot of great coffee shops throughout the state, and quite a few use locally roasted beans. How awesome is that?! One of my favorites is Amity Coffee Roasters & Café in Greenwood. Not only do they roast their own beans on site, but they also have an adorable little café complete with an antique shop! I love the small town vibe and being able to relax on a big comfy couch while sipping my caramel latte. Pure heaven! I just knew I needed to create a cookie combining my love for those caramel lattes and chocolate. This recipe is essentially a chocolate chip cookie, but elevated to a whole new level. 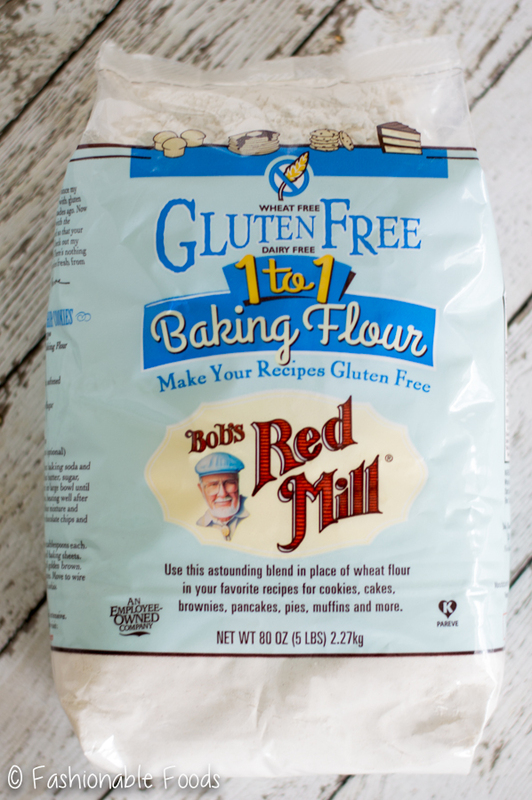 We start out with my go-to (gluten-free) flour: Bob’s Red Mill Gluten Free 1 to 1 Baking Flour. This flour combines finely ground brown rice flour, sweet white rice flour, whole grain sorghum flour, potato starch, and tapioca flour with a touch of xanthan gum—just enough xanthan gum to create chewy cookies and springy muffins. 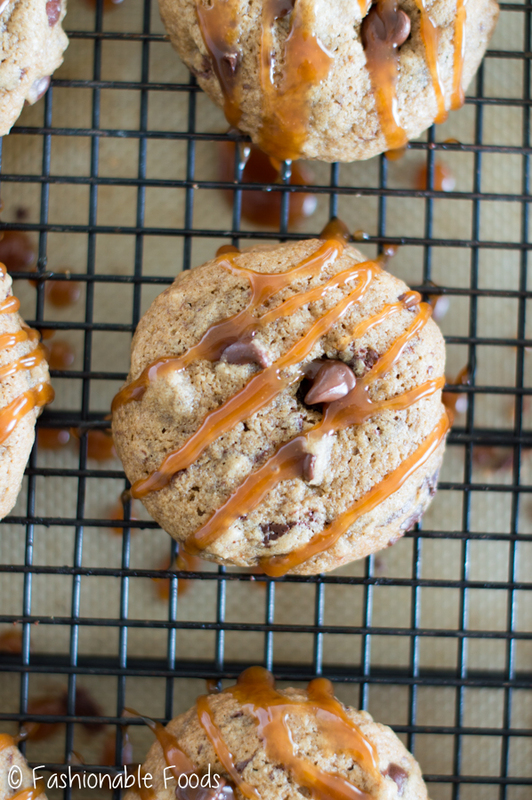 These caramel mocha cookies do come out perfectly chewy, by the way! 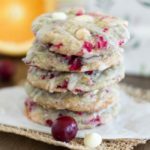 Aside from having the right gluten-free flour, there are a few techniques that create a chewy cookie. First, you don’t want to “cream” the butter and sugar together. You want to use butter that is slightly melted and then just mix it together with the sugar. I prefer to do this by hand in leu of using a mixer. That way you don’t whip in too much air, which results in flat cookies. Speaking of sugar, I use a higher ratio of brown sugar to granulated white sugar. I really love the flavor brown sugar adds, plus it helps the chew factor of the cookies! Soft, chewy cookies are my favorite type of cookies.. and these definitely fit the bill! Let’s talk about the star of this post: the coffee! If you’re a coffee lover, you are probably like me and have a variety of coffee choices on hand. I keep everything from locally roasted coffee beans to flavored coffees to instant espresso packets in my pantry. I tried this recipe with both a big scoop of freshly ground coffee beans and also the same amount of instant espresso. Both came out delicious, but I’m partial to the freshly ground local coffee. Obviously. ? My point is, you can use whatever you like. If you’re not a big coffee drinker maybe you don’t keep it in your house, or maybe you only use K-Cups, in which case the instant espresso packets would make sense! As for the chocolate, I like to use a mixture of semi-sweet chocolate chips and chopped bittersweet chocolate. I love the contrast in texture and flavor, plus it looks pretty in the cookie. You’ll also notice I add in sea salt flakes with the chocolate. I love doing this because you get a better balance of the sweet-salty combo. Plus, we all know how well salt pairs with caramel! Once you have your dough mixed up, I recommend scooping out balls of dough with a medium-sized cookie scoop. Place them on a baking sheet lined with parchment or a silicone mat and then chill! The chilling is the most important step in creating the perfect soft and chewy cookie. If you don’t have room in your fridge for a baking sheet, you can just chill the dough right in the bowl you mixed it in. However, this makes it more difficult to scoop the dough since it will harden up. You’ll just need to use a little elbow grease! You can also freeze the dough balls on a cookie sheet until frozen sold. Then, transfer the cookies to freezer bags and pop them back in the freezer. 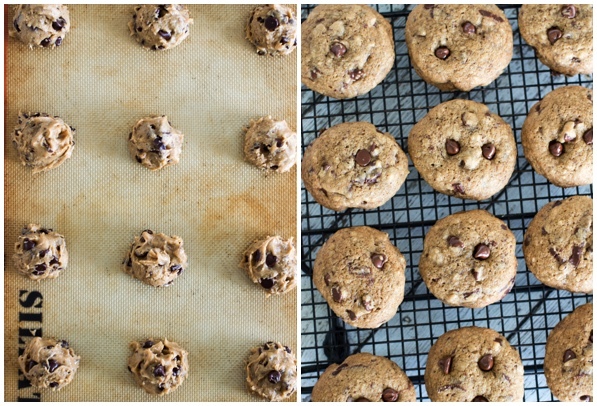 Now when you get a cookie craving, you can just pull a few out and bake them! Now comes the caramel! 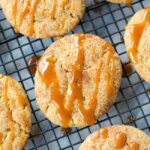 You guys know how much I love homemade caramel sauce, so it’s only fitting that I drizzle it over these cookies! Of course, you don’t have to make the caramel sauce if you don’t want to. 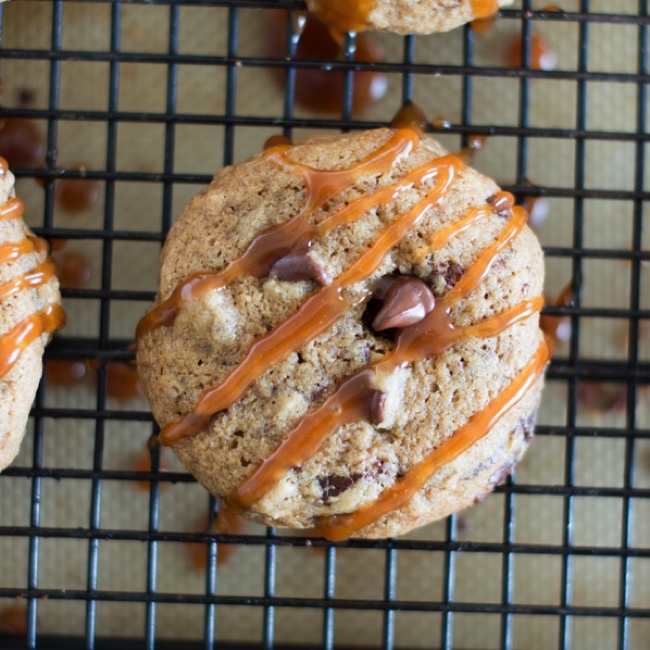 You can heat up your favorite store-bought caramel and drizzle over the cookies. I do highly recommend making your own, though! It’s not difficult, you can do it in advance, and then keep it in your fridge. I always have some in mine! Every state has something that truly makes it special and we’re celebrating that diversity in cookie form! 50 states, 50 bloggers, 50 cookies, with one mission — to bring our country together for a sweet treat that celebrates our wonderful nation. Be sure to check out the United States of Cookies here! You can also find a Bob’s Red Mill coupon here! A holiday cookie inspired by two of my favorite treats: chocolate chip cookies and caramel lattes. 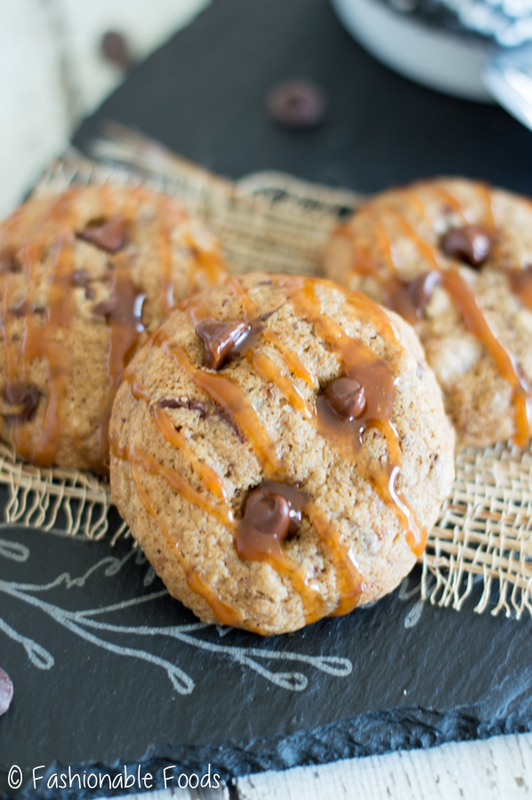 These caramel mocha cookies allow you to have your coffee in cookie form! 4 Tablespoons Butter, salted or unsalted are fine! Whisk together the flour and baking soda, and then set aside. In a large bowl, mix together the butter and sugars. Next, stir in the coffee, eggs, and vanilla. Make sure you don’t overmix! Add in the flour mixture, in 3-4 additions, mixing until just combined. Fold in the chocolate chips, bittersweet chocolate, and sea salt. Scoop the dough using a medium cookie scoop onto a baking sheet lined with parchment or a silicone mat, placing the cookies about 1 ½ inches apart. Chill the dough for at least 2 hours in the fridge. 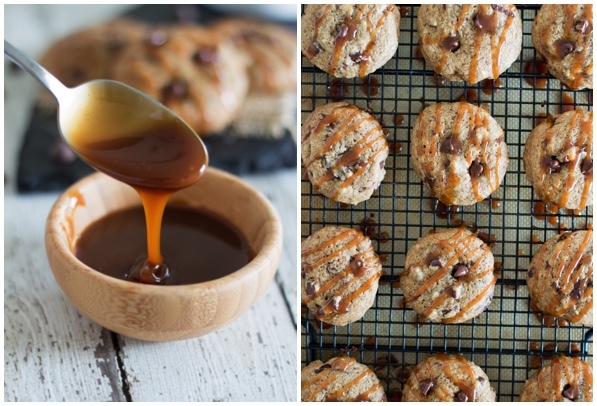 Make the caramel while your cookies are chilling! Combine the sugar and water in a medium pot over medium-high heat. Continue stirring until the sugar begins to dissolve. Keep a very close eye on the sugar mixture – it will go from liquid to sugar crystals and then melt into an amber color liquid. This takes about 8 minutes. Once it’s an amber colored liquid, very carefully add in the butter. It will spatter and foam. Once the butter is completely melted and the caramel sauce is bubbling again, pour in the heavy cream. Again, it will spatter and foam, but keep stirring. Remove the caramel from the heat and let it cool until you’re ready to use it. It will harden a bit as it cools, so simply heat it up again and if necessary, add some water to thin it out. Bake the cookies for 13-15 minutes, or until lightly browned around the edges. Remove the cookies from the oven and let cool for 10 minutes on the baking sheet. Transfer them to a cooling rack to cool completely before drizzling with caramel sauce. *Recipe yields around 32 cookies - more or less depending on the size you make them. I would have never pegged Delaware as a state for coffee, so thank you for that fun fact! These cookies look just amazing, Keri!! I’d say you did Delaware PROUD! 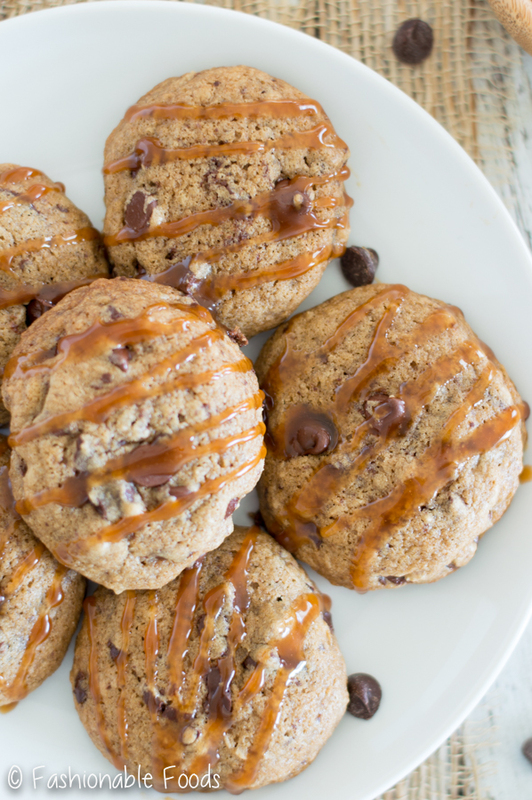 Seriously, caramel and mocha loaded cookies? DROOL!!! 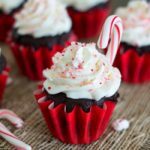 I’ll need to triple this recipe, because this girl needs a few dozen of these beauties! Cheers! Yay for Delaware cookies! You did such a great job on these cookies, Keri! No need to be nervous! I would gladly eat these ALL, espsecially since there’s caramel and mocha in here! And yay for coffee, too! 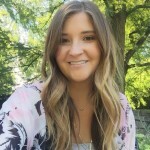 Love this fun mashup, Keri! OHHHH MY GOODNESS!!!! I am drooling!!!! OMG! This is what I call cookie perfection.These caramel mocha cookies are making me drool, Keri. I so wish I could grab a few of the right away.